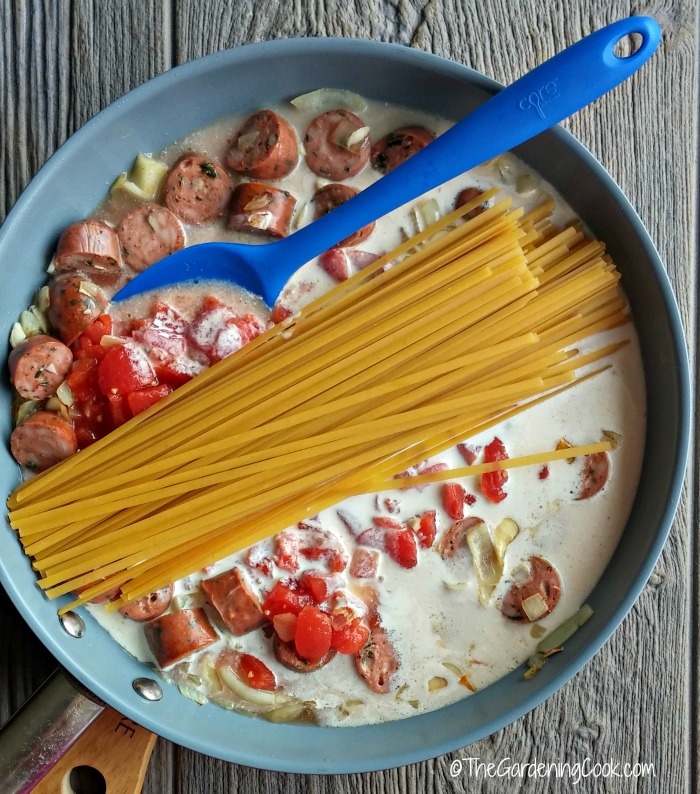 I love fettuccine, my whole family loves sausages, and I love meals that come together easily. 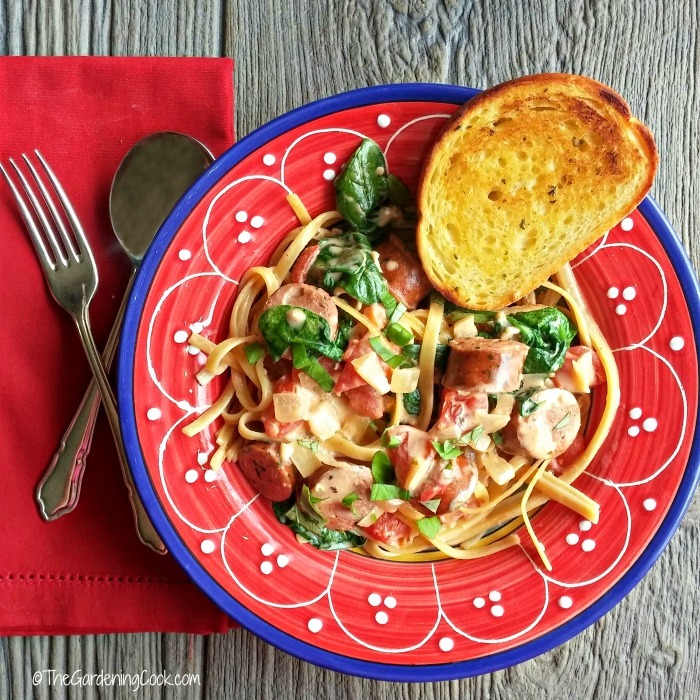 This one pot creamy spinach sausage fettuccine recipe is one that I get asked to make again and again. It is that tasty! This is a sponsored conversation written by me on behalf of Aidells. The opinions and text are all mine. It’s time for creamy spinach sausage fettuccine! 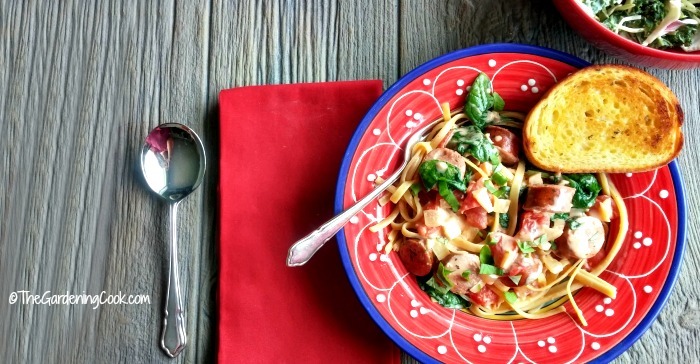 This One Pot Creamy Spinach Sausage Fettuccine dish will be the delight of your family. Don’t you just love it when a recipe ticks all the boxes? This recipe is a winner in every department. I just love how easy it is to put it together. The star of this recipe is a new sausage that I have just discovered. Aidells® sausages are AMAZING. These sausages have unique flavors and are hand-crafted. They are gluten free and contain no nitrates. And the best part, for busy homemakers, is that they are fully cooked and ready in just 8-10 minutes. They also have a really wonderful and interesting range of flavors. 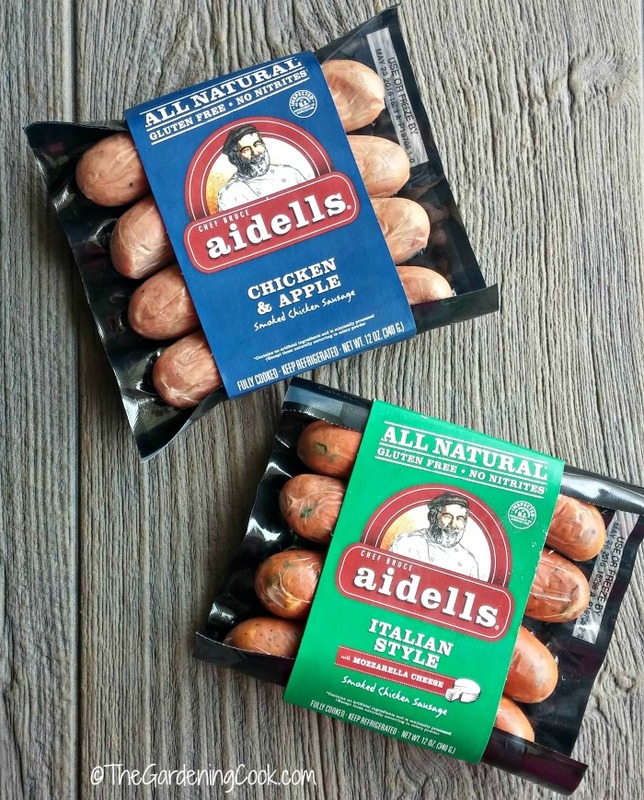 I chose Aidells® Italian Style sausages for this recipe, but also picked up some Chicken & Apple flavor to try at another meal. When I assembled these ingredients together, it made me wish that dinner time was here right now. ? Who doesn’t like cream and fettuccine and garlic and tomatoes and more? 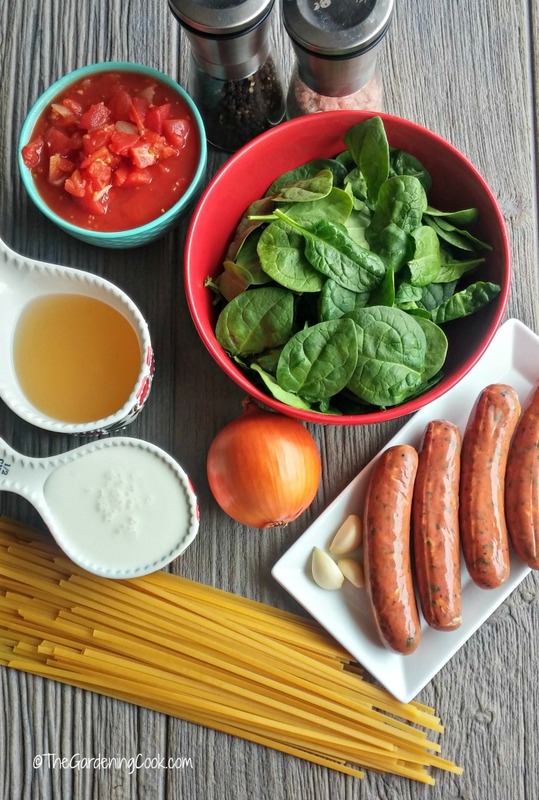 To make this spinach sausage fettuccine start by heating the olive oil in a large, deep non stick skillet or dutch oven over medium heat. Cook the onions until they are translucent but not too browned. Next, cut your Aidells® Italian Style sausages into rounds. They are already cooked and cutting them into rounds gives a great presentation to the dish and also makes it quicker to heat them back to the correct temperature. Add the sausages to the onions and cook them for a minute or so. Now turn the heat to low and add in the garlic. TIP: I always add my garlic later in a recipe. It burns very easily and adding it at the end of the cooking time helps to prevent this. In goes the chicken broth, cream, tomatoes and fettuccine noodles. Stir it all together and bring it back to a boil, then lower the heat, cover it and simmer for 15 minutes while you have a glass of wine (my favorite part of the recipe! ?) I used a 14 inch green pan and my fettucine fit in perfectly. The spinach goes in at the end with some pink sea salt and pepper to taste. Just a few minutes until they have wilted and the recipe is done. How cool and easy is that? The taste of this recipe is just amazing! It is rich and creamy with a lovely hint of Italian flavors and Mozzarella cheese from the sausages. All of the ingredients combine to make for a party in your mouth! It’s hard to believe this whole meal is on the table in just about 20 minutes and it’s all done in one pot! 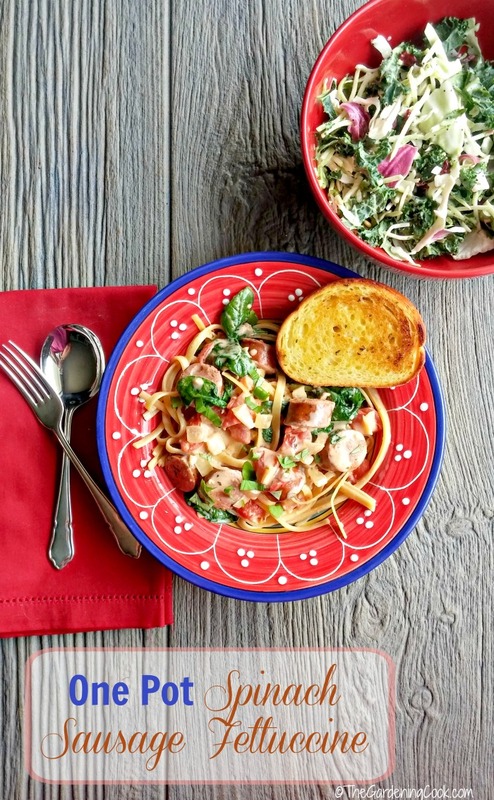 This spinach sausage fettuccine is perfect served with a side salad, or herbed garlic bread (or both!) It is a dish made in foodie heaven. Would you like to make this recipe for your family? Head on over to your local Publix store and get the ingredients. What is your favorite way to use sausages in your dinner recipes? 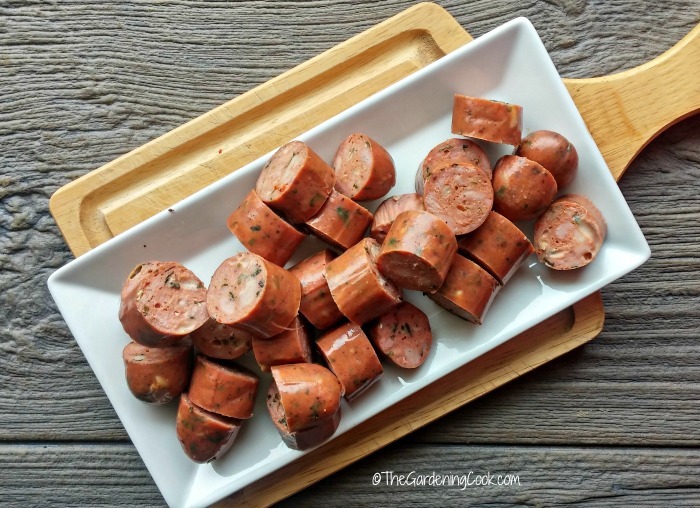 I am really interested in hearing the ways my readers incorporate sausages into their recipes. 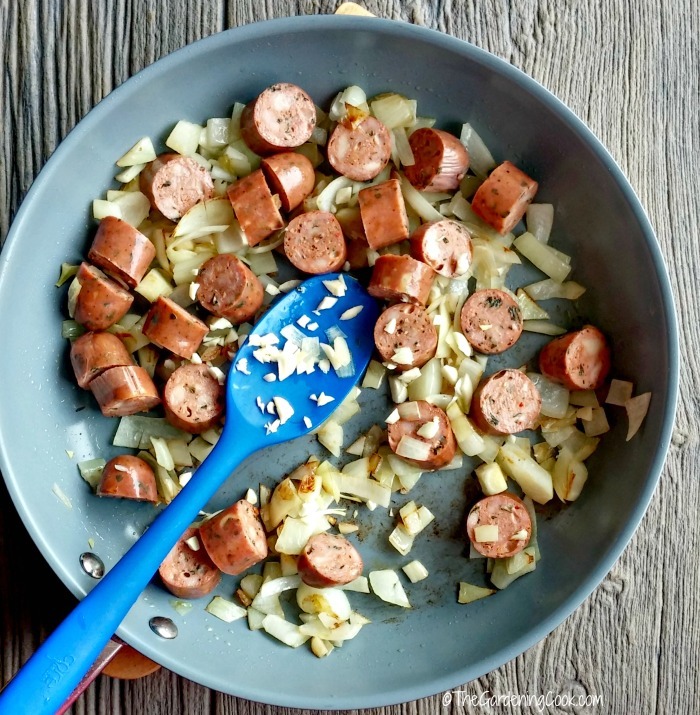 What is your favorite way to incorporate sausages into your dinner time meals. Please let me know in the comments below. 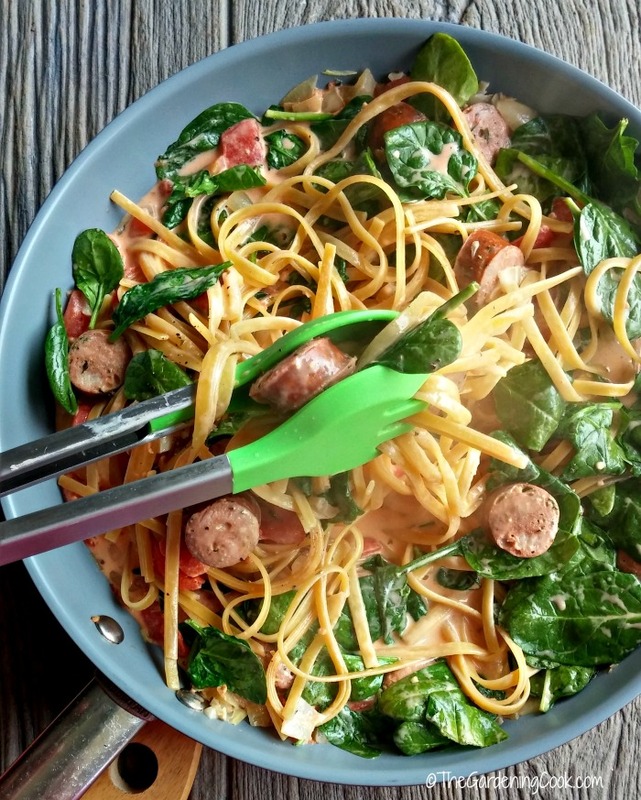 This delicious creamy spinach sausage fettuccine comes together in one pot and tastes amazing. Heat the olive oil in a large non stick skillet over medium heat. 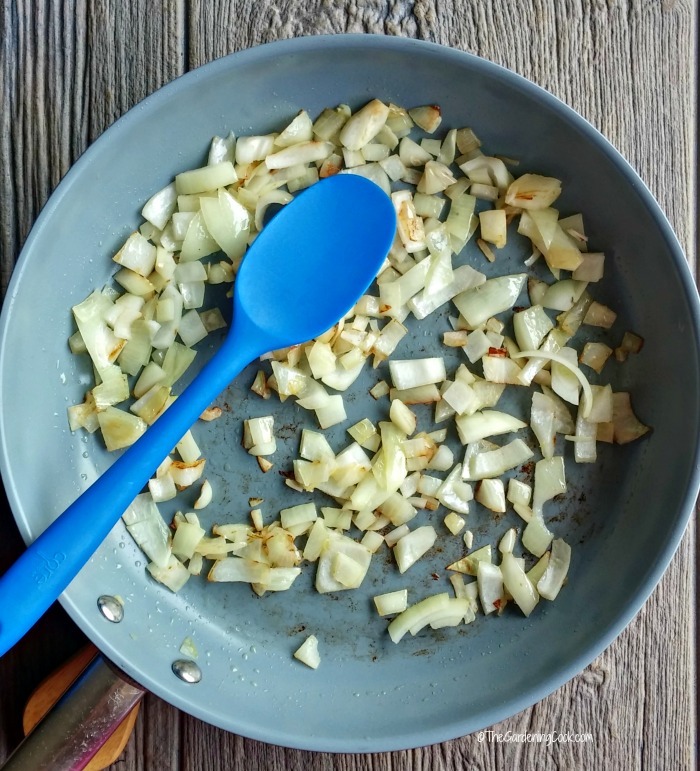 When the oil is very hot, add the onions and cook until they are translucent. Cut the sausages into rounds and add them into the pan. Cook until they are warmed through. Reduce heat to low, then add the garlic and stir until fragrant, about 30 seconds. Add the chicken broth, tomatoes, cream, and flat noodles to the skillet. Stir to combine. Increase heat and bring to a boil. Cover, then reduce the heat and simmer for 15 minutes until the noodles are tender and heated through. Season with salt and pepper to taste. Add the spinach and stir until they have softened and wilted. Remove from heat and serve immediately.